Few would guess that the Oakland Airport could provide the setting for an initial encounter that would one day lead to marriage. But that is precisely what happened to Paige Finster and Christopher Greenspan, who were both attending USC and had journeyed to the Bay Area to watch the Trojans take on the Cal Berkeley Bears. Both were scheduled on the same flight, which was delayed for four hours. They spent the entire wait engrossed in conversation and before boarding Paige, used Christopher’s cell phone to call her mom, to whom she divulged she had just met the man she would marry! It seemed they had been destined to meet, and little did either know that they shared majors and had actually been sitting just two rows apart for the past several months in two lecture courses. In class the next day, the two exchanged numbers, after which they built a strong friendship and subsequent romance. Both Paige and Christopher wanted an outdoor ceremony and afternoon wedding, a desire that was perfectly realized at the breathtaking Riviera Country Club in Pacific Palisades. It was an especially fitting locale, considering Christopher, an avid golfer, had played many a round there while growing up and the two spent one of their first dates there taking in the Nissan Open. 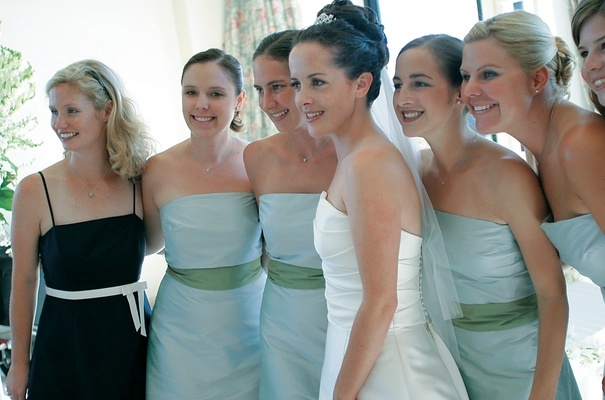 Held on the outside terrace at the Riviera, which is surrounded by lush trees and offers captivating ocean views, the ceremony incorporated the bride and groom’s respective Catholic and Jewish faiths. 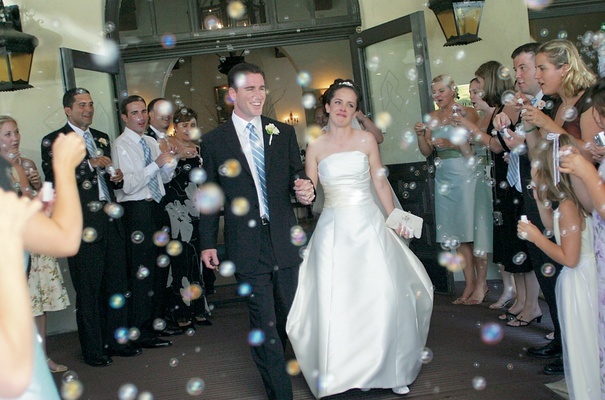 In a wonderful touch, Paige and Christopher chose to be married by the same minister who married the groom’s Catholic mother and Jewish father thirty-two years earlier. 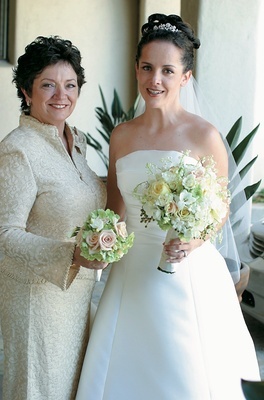 Christopher’s grandmother and Paige’s best friend, Tanja, who traveled from Ireland for the event, gave heartfelt readings, and the bride and groom wrote their own vows, which they composed with great care and shared with one another for the first time at the ceremony. Paige and Christopher also followed Jewish tradition by sharing from a glass of wine that was later broken at the conclusion of the ceremony. The radiant bride wore an elegant, formal wedding gown that corresponded perfectly with the ceremony and reception’s myriad of flowers. 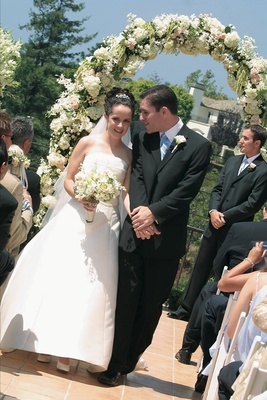 The archway, which the bride and groom utilized in place of a chuppa, was an extraordinary arrangement of hundreds of white hydrangeas, white roses, and orchids. 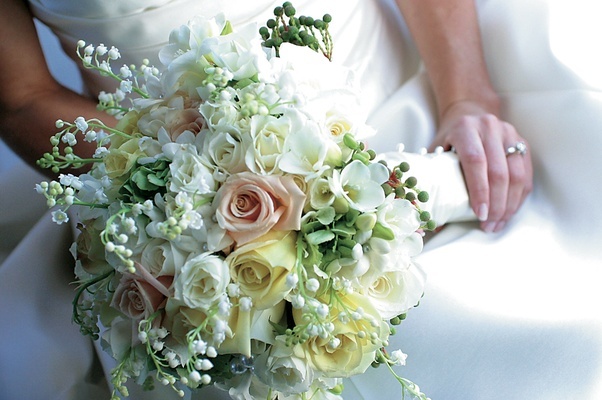 Paige’s bouquet was a gorgeous combination of white and cream roses with lilies of the valley and orchids, which were contrasted by the bridesmaids’ bouquets of white and cream roses with hydrangeas. 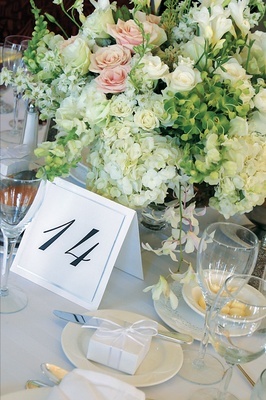 At the reception, which began with a cocktail hour, guests enjoyed an array of appetizers that included artichoke hearts with crabmeat, marinated goat cheese on croutons, smoked salmon on bruschetta with cucumber and crème fraiche, shrimp, and sea scallops. These were followed by a salad of baby greens with candied walnuts, bleu cheese and apples with balsamic vinaigrette. The entrée was a choice of filet of sea bass with papaya mango cilantro salsa served with duchess garlic potatoes or stuffed breast of chicken with cilantro and goat cheese pesto with a blush wine sauce served with rosemary red roasted potatoes, asparagus, broccoli and carved tomato. 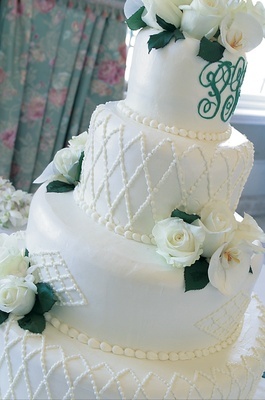 The wedding cake consisted of four tiers of white cake with fresh strawberries and cream, frosted with a white buttercream and adorned with white roses and orchids. The groom, who has a love for carrot cake, was surprised to find Paige had arranged for a special groom’s cake made of Christopher’s absolute favorite: Costco carrot cake, in this case specially decorated with a golf motif. Guests also received white gift boxes tied with a sheer white bow that sat atop each place setting—an Italian tradition done by hand by Christopher’s Italian grandmother. In what the couple concurs was the biggest surprise of the day, following the reception’s salad course, Christopher’s parents ascended the stage to unveil a special treat, something they had somehow kept secret from the bride and groom for months. At just that moment, the USC Trojan Marching Band announced their arrival in a thunderous gift of music. 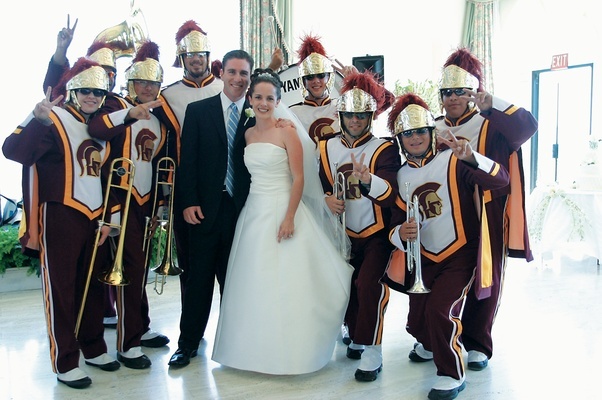 The bride and groom, who’ve not missed a Trojan home game since 1996, were stunned and delighted by the display, the perfect element for a wedding whose roots trace back to classes at USC. Following the wedding, the couple spent their wedding night in their new home in Culver City, which they had been busily remodeling and waiting to move into until after they married. The two honeymooned at the fabulous Hapuna Hotel at the Mauna Kea Resort on the big island of Hawaii.